After checking the couple out, the doctor tells them that they were physically okay but might want to start writing things down and make notes to help them remember things. Later that night while watching TV, the old man got up from his chair and his wife asks, "Where are you going?" He replies, "To the kitchen." She asks, "Will you get me a bowl of ice cream?" He replies, "Sure." She then asks him, "Don't you think you should write it down so you can remember it?" He says, "No, I can remember that." She then says, "Well, I also would like some strawberries on top. You had better write that down cause I know you'll forget that." 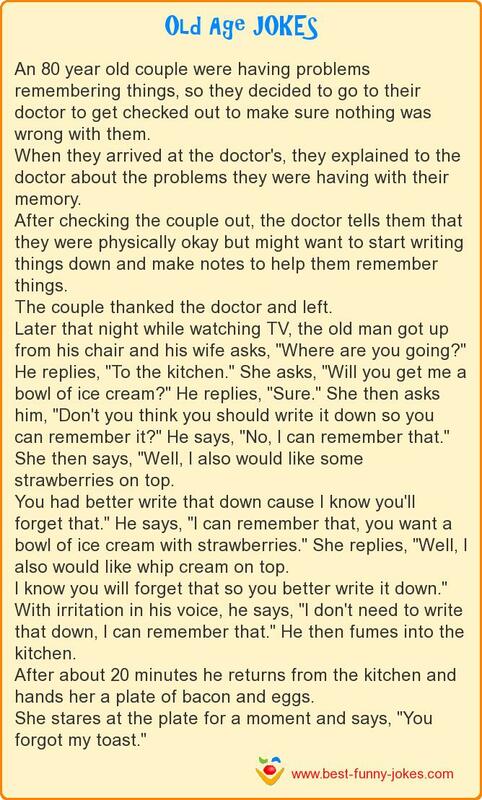 He says, "I can remember that, you want a bowl of ice cream with strawberries." She replies, "Well, I also would like whip cream on top. I know you will forget that so you better write it down." With irritation in his voice, he says, "I don't need to write that down, I can remember that." He then fumes into the kitchen.